We understand that while you need dental care, you may have limited or no dental insurance and/or don’t have funds immediately available. It’s for this reason that we offer flexible payment plans. Two are available through our office and two are offered through popular financing companies. We offer a treatment-specific payment plan that allows you to pay your total balance in one to four payments. While this option does not require a credit check, a 5% financing fee will be added. You will need to speak with our office staff for specific terms. Note that this option is NOT available for extractions, fillings, or same-day crowns. We offer an introductory package for new patients that need basic dental care. This is an affordable way to evaluate your dental health and get a cleaning. This may be combined with specific treatments but not combined with the Pure Dental Plus package below. *Note that if the exam shows that you have gum disease, a cleaning may not be the best option for the visit. We will advise you on the best option and this evaluation is part of the $99 package. Our affordable dental discount plan, called Pure Dental Plus, is recommended for all of our patients. Pure Dental Plus (PDP) includes 2 dental cleanings/exams per year, free whitening gel, and discounts on all of our services. Operating similarly to an insurance plan (with a base payment and discounts), it is very popular. Note that the package does NOT work with any other specials or in conjunction with dental insurance. 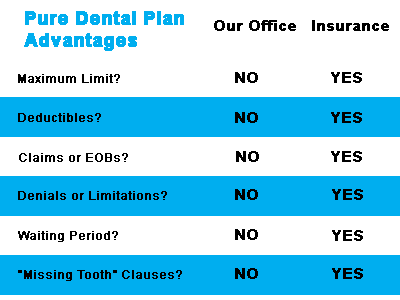 Call our office for details or book an appointment to come in and discuss details of the Pure Dental Plan. We also accept third party financing from our partners below which will allow you to get any dental procedure financed including extractions and fillings. They also cover things that your insurance plan may not. Some conditions apply. CareCredit gives you the freedom to get your procedure whenever you’re ready. It’s easy to apply with three simple steps. Just go to www.carecredit.com for an instant approval response. CareCredit covers your patient out-of-pocket portions including: treatment fees, deductibles, co-payments and any fees that are not listed under your current insurance plan. You can have the convenience of 0% interest on financing for up to 18 months or low-interest financing from 24 to 48 months! CareCredit will check your credit and approval is based on credit worthiness. They do accept co-signers for those with low credit or no credit history. Compassionate Finance™ is a financial services company that offers affordable payment plans. To apply for Compassionate Finance you will fill out a paper application, turn it into our office, and one of our financial coordinators will run your credit information and get back to you within 24 hours with approval (we handle all of this in-house but you can visit their website for more information – www.compassionatefinance.com). Compassionate Finance takes into consideration other factors aside from credit alone which makes it a possible solution even for those who don’t qualify for Care Credit. To quality, you will need an active bank account. Compassionate Finance™ payment plans provide flexible payment terms, fixed interest rates and allow patients to select their monthly payment date and rate. A down payment of 50% of the total cost of the treatment is required to get started, and the remaining balance can be financed into flexible monthly payments. (The exact down payment amount and length of payment terms is determined based on the treatment you need and other specifics affected by the specifics of your treatment plan.) Your treatment plan total must be at least $1000 to use Compassionate Finance. and the flexible payment terms that you need.